Freedom and Flourishing: Should scientists be seeking to persuade or inform? Should scientists be seeking to persuade or inform? When I hear scientists engaged in policy advocacy I often cheer them on. At other times I make cynical comments questioning whether their conjectures have any substance. I notice that other people seem to have similar reactions, but some jeer when I cheer and vice versa. In thinking about my own reactions I am able to rule out some possible reasons for negativity without much difficulty. Expertise: My reactions are not always closely related to my own expertise. I can react positively or negatively to scientific advocacy in relation to areas of public policy in which I have no expertise as well as in aspects of economic policy where I can claim some expertise. Conservatism: My reactions do not seem to be consistently conservative in the sense of being cautious about change. Sometimes I feel that scientists are setting out to make me worry unduly about the implications of our current lifestyles, but I am less inclined to feel that they are trying to make me feel more complacent than I should be about potential adverse effects of various innovations e.g. GM food or health effects of living close to power lines or wind farms. Research funding: My reactions are not necessarily related to the question of how the scientists fund their research. In some instances I might suspect that they are advocating in the interests of the people who have provided funding, or slanting their presentations to further their interests in obtaining more funding, but such factors are not always relevant. Indoctrination: My reactions are unlikely to be the result of indoctrination by particular branches of the news media. I am exposed to a range of media organisations with a range of different biases. I had to think more carefully about whether my reactions could be related to the presentation skills of the scientists. I know I have a strong allergic reaction to being preached at or manipulated. So, I took a look at Jason Nazar’s 21 principles of persuasion and some other web sites discussing the art of persuasion. In the end I realized that I don’t have too much difficulty these days in being able to appreciate the persuasive skills of speakers while disagreeing with the messages they are presenting. I can also support the message being presented by speakers while thinking they could do with some help to improve their presentation skills. Membership of Toastmasters encourages people to think about such matters. It was not until I stumbled on an article by Dan Kahan on the science of science communication that I realized that the reactions that people have to advocacy by scientists might be related to Bryan Caplan’s concept of rational irrationality and Jonathan Haidt’s moral foundations theory (which have previously been discussed on this blog). Caplan suggests that people can have an almost religious attachment to irrational beliefs about economics, while Haidt suggests that identification with groups tends to blind people to the wisdom of people outside those groups. Cutting to the chase, Kahan tests the performance of two hypotheses to explain why there is so much public dispute over science-based conjectures about the risks that humans are facing. The first thesis, the public irrationality thesis (PIT), predicts that the gap between public and expert assessments of risk narrows as members of the public become more literate about science. On that basis, people who scored highest on science comprehension could be expected to be more concerned about climate change than those with lower scores. However, this doesn’t happen - at least it doesn’t happen in studies cited by the author. The second thesis, the cultural cognition thesis (CCT) posits that certain types of group affinities are integral to the mental processes ordinary members of the public use to assess risk. Kahan cites various studies that have tested CCT, but the results of one which tests CCT head to head against PIT are particularly interesting. 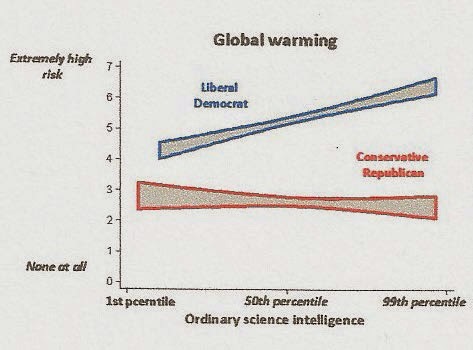 The results show that on issues that have become politicized – such as global warming and fracking – the average divergence between risk assessments of people who identify as liberal democrats and conservative republicans is greater among those who have high levels science comprehension than among those who have low levels of science comprehension. (See chart below.) The results suggest that individuals who are most adept at scientific reasoning search out evidence to support their cultural dispositions. The study suggests that there is little difference between risk assessment of liberals and conservatives on issues that have not become politicized e.g. artificial food colourings, exposure to radio waves from cell phones, GM food, exposure to magnetic field of high voltage power lines, use of artificial sweeteners and nanotechnology. The PIT thesis does apply to such issues. I guess the results might differ in countries where some of these issues, e.g. the risks associated with GM food, have become politicized. My immediate reaction was along the lines that they would say that wouldn’t they. Those who preach about the end of the world can always be expected to tell us to repent now for the end of the world is nigh. Would you expect them to say that it is now too late to do avoid catastrophe, or that there is no need to worry much for the next 20 years or so? I claim no expertise in climate modelling, but the little I know suggests to me that current models are not reliable enough to tell us that it is critical that further action be initiated in 2015. Such claims seem to me to be more like hysteria than science. That leaves those of us who accept the physics of the greenhouse effect with great difficulty in assessing the urgency of the threat to humanity that it may involve. It is easy enough to find 22 ways to think about the climate debate, but it isn’t easy to find a dispassionate expert overview of the relevant science. Nearly all leading scientists seem to have become preachers. When scientists seek to persuade people to adopt particular positions on contentious policy issues it is inevitable that they will be seen to be preaching rather than presenting information on the current state of knowledge. If scientists want to be listened to by people other than their political cheer squads of “true believers” they should distance themselves from policy debate and display some modesty about the quality of their conjectures.